will show on screen for download and we will email you a copy. 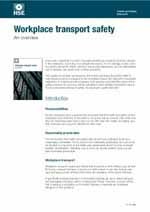 Published by the HSE this 22 page booklet is designed to raise awareness of current dangers with transport in the workplace. Click here to see the whole document.